I hope you had a lovely Valentine’s Day and are in the midst of enjoying this long President’s Day weekend. It’s a leisurely Sunday in our home; and it’s another sweet potato recipe this week. Well, this isn’t just another sweet potato recipe in our home. It’s one of our mainstays, lighter and healthier sweet potato casserole. I don’t know why I haven’t done more posts on sweet potatoes. They are as much a staple in our home as brown rice. And if you are a regular visitor to this site, you know how much we love rice around here. We roast a whole bunch of sweet potatoes on the weekend and have them throughout the week. They are so delicious piping hot right out of the oven. And they are just as delicious cold right out of the fridge. I just love the wonderfully complex sweet flavor of these root vegetables. And despite their complex deep sweet flavor, they are so easy to pair with other spices and ingredients. That’s why sweet potatoes are easily one of my favorite things to eat and cook. 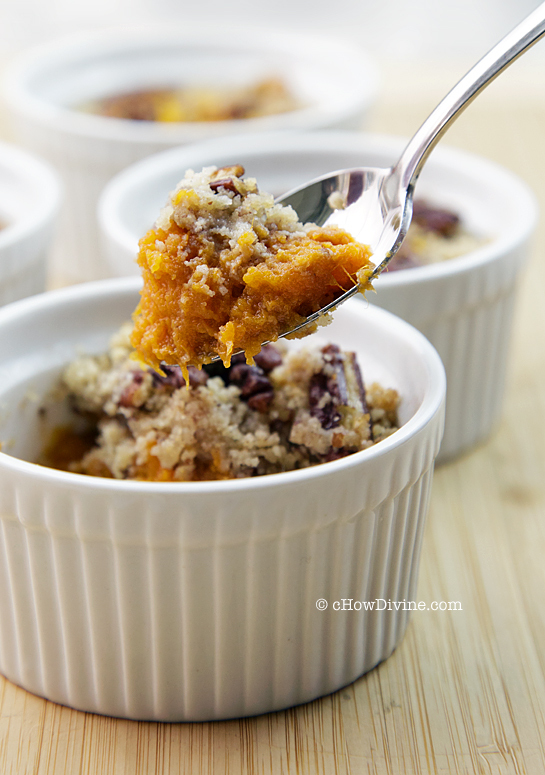 This simple sweet potato casserole is probably my husband’s favorite sweet potato dish. If he could, he would have it everyday – for every meal. 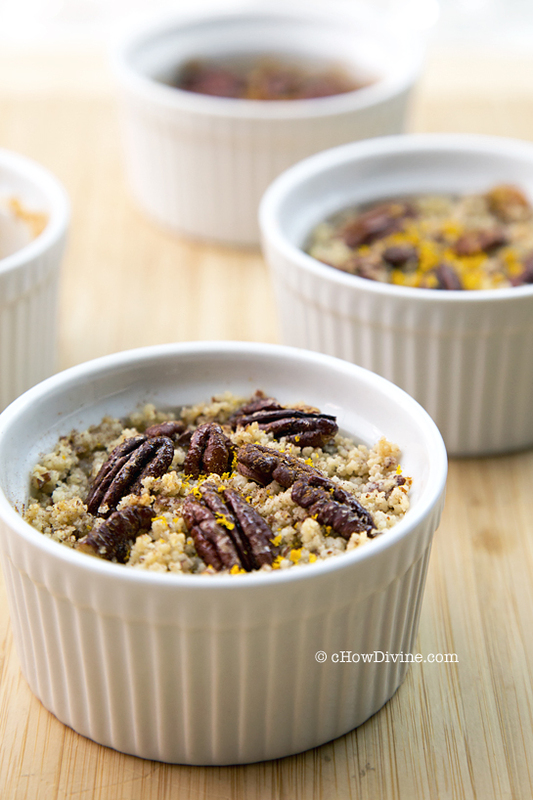 This sweet potato casserole is super healthy for you, but it tastes like a decadently rich dessert. But guess what? It’s dairy-free, gluten-free, paleo-friendly, not to mention kid-friendly. Just go easy on the ginger if you are making this for kids. They’ll think it’s dessert and ask for seconds. This is SO SO delicious! Mash together sweet potato, OJ, grated ginger, and 1 TB of maple syrup together. Mix thoroughly. Mix together pecans and 1 TB of maple syrup. Set aside 1/2 of the maple-coated pecans for later use. In a small processor, add almond flour, coconut butter, rest of the maple-coated pecans (be sure to scrape in the excess syrup), ~1/4 tsp of cinnamon, and a pinch of salt. Process for a few seconds; then pulse until a crumbly texture forms and the pecans are broken into small pieces. Divide the sweet potato into 4 8-oz ramekins. Spoon the crumble mixture on top of the sweet potato. Add rest of the pecans on top of the crumble. Bake covered for about 10-15 minutes (depending on the temperature of the sweet potato)*. Uncover and bake for another 10 minutes or until the pecans are nicely toasted and the crumble becomes golden. Remove from heat and sprinkle with the orange zest if using. Allow to cool for a few minutes and serve. Baking time will vary by a few minutes depending on the temperature of the sweet potatoes. If they were just baked and still warm, bake covered for about 8-10 minutes before uncovering. If they came out of the fridge and are cold, bake covered for about 15 minutes before uncovering. If preferred, just bake this in a larger casserole dish. Be sure to double or triple the recipe depending on the size of the casserole dish. We love sweet potatoes too! And often store leftover roasted ones in the refrigerator for a nice snack. 😉 Love this casserole — this looks terrific. Thanks. I love love sweet potatoes too. I love tasting it when it’s freshly hot out of the oven, especially on a cold winter day. What kind of sweet potatoes do you like best btw? I love the golden Korean kind! My favorite is the Korean potato with the pale yellow flesh. I think it’s the same as Japanese yams. I could eat a ton of those. But when I cook, I usually cook with the red sweet potatoes. Maybe it’s a Korean thing, but I love carbs of all types! Great to have you blogging again. I’m excited to see what great recipes you have in store for 2014! x. Thank you for the boost of energy Zoe! Hope the New Year has been nothing but good to you! Oh we could eat sweet potatoes every week as well. They are so good and I love cooking with different varieties. Love this simple little recipe! It has all the flavors I love with sweet potatoes in one little dish. Will be giving this a try soon! You wouldn’t believe the amount of sweet potatoes we consume. :D We love them! Give these a try. They really taste like dessert. I always have to make two for my husband – one as a side and the other as dessert. Thanks MJ!